I will give that idea some thought. I would worry somewhat about losing the only copy that I personally know still exists, but I might be willing to make an effort for the greater good. I would want the copier to make me several back-ups. Is there any way to break copy protection and create an ATR of a protected disk? I guess that the copy protection has not been altered by the Omniview people from the original one by Atari. Create a sector copy of it using Disk Wizard II and (if possible) print the map it "creates on the fly" via SIO2PC/RespQt to a text file. 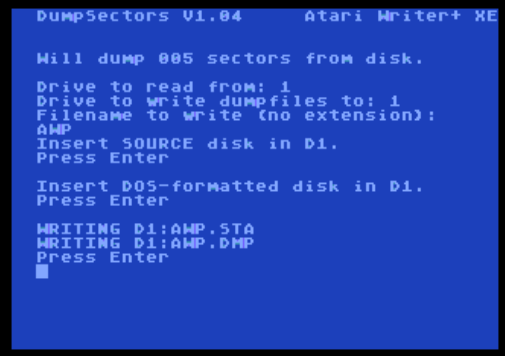 Then boot the attached Dos25Extract.atr either via SIO2PC or from a real write-enabled floppy. Let it read from your (write-protected) original disk and write back to the ATR. Post everything you created here. Edited by DjayBee, Sat Mar 24, 2018 3:11 AM. The executable file should copy just fine: there's not even any particular need for a binary copy of the disk, at least for the purposes of running the program in an emulator. IIRC, AW+ copy protection relied on attempting to read a bad sector via code which is easily replaced by NOPs. I did this in 1990 or so when I wanted to run the application off a 360KB floppy. Correction to a previous post, my RAMBO is an original, I have a Bits-of-the-Past on an XL. Are you saying that you have an original Rambo that is NOT installed in an XL? If it is installed in an XE (which have the Freddy chip that XL's don't) then I think it's possible to make it 100% XE memory compatible. I would think, I've never upgraded an XE before myself. I went from a 130XE with only 128K to XL's with 256/512K Rambo upgrades as I didn't care about little-used compatibility with Antic access. I have an original RAMBO but it is installed in a 1200XL. I have a piggyback OmniView that was installed in an 800XL, I took it out of the XL and tried it in an XE. It works fine in the XE and with the Atariwriter+ 80 which was modified by David Young to work with Omniview. The AW+80 will not work with the 1200XL or the 800XL. I tried the AW+80 on an 800XL with wiztronics 256 and omniview; the program would not load. 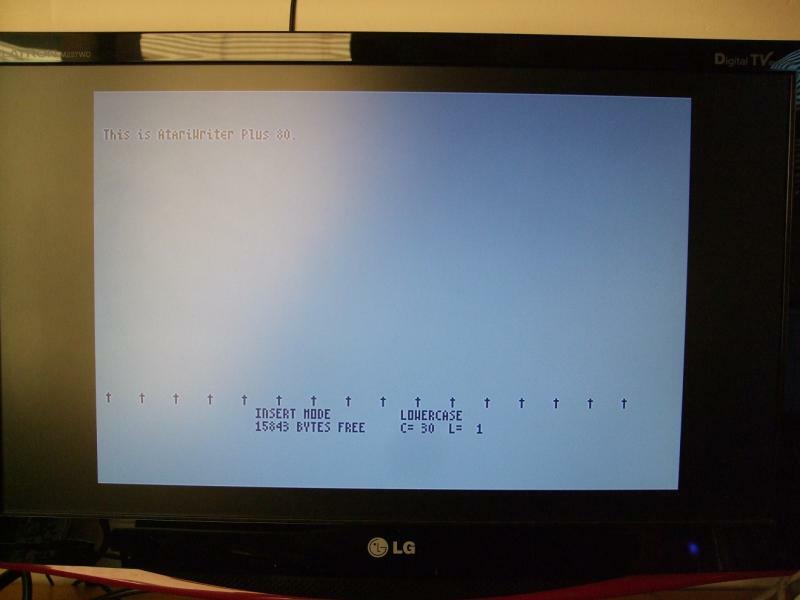 I tried AW+80 on a 1200XL with RAMBO and 32-n-1 omniview; the program would load but the screen was subject to rapid flickering and would not work. I then tried AW+80 on an 800XL and the Omniview Piggyback setup. The results were the same as on the 1200XL. I concluded that the AW+80 will only work on a 130XE with omniview. The RAMBO and Wiztronics upgrades are supposed to be XE compatible but they are not compatible in ALL cases. I have tried to perform the actions using real floppies and when I run the Disk Wizard it tells me that all of the sectors are bad. I am way out of my league here. I have never done anything with SIO2PC. Is there a copy program that can be put on a floppy that will copy the original AWP disk. I will try to familiarize myself with the SIO2PC stuff. I would like to make this program available to anyone who wants it. I find it hard to believe that no one else among all of the Atari enthusiasts that read these forums has ever used or owned this program. I have even tried to track down David Young and other people who created OmniView and the modified AWP but have been unsuccessful. All sectors bad? Do you maybe have a drive # conflict when the sio2pc is attached? Ie both physical drive 1 and an emulated drive 1 might both respond to any commands to that ID causing all reads to fail. I'd be willing to try to help figure this out with a phone or skype call to give you a hand. If you're up for that I'll pm you. I am not using an sio2pc. I have never done that. I downloaded disk wizard to a disk emulator then copied the program to a real floppy. There are people on these forums that have hardware capable of copying any copy protected disk. You'd have to be willing to send it to them. Farb is one such individual. I have some disks I'll be sending him, and he even has offered to pay for shipping to and from. Anything that hasn't been archived is of interest to the whole community. For things that are more uncommon, like what you have, it's even more of an interest, especially since word processing in 80 columns is somewhat of a grail on these machines. I would be willing to send the disk that I have, what is the address and Person to Contact. Contact Farb. He's a trusted individual that's heading up the great Software Preservation Initiative. Ran it in Altirra for now (will test on real hardware later), but it's pretty interesting. Must keep the display buffer in extended RAM (it depends on ANTIC banking), and the editor is kept responsive by not updating the display very often (you can type an entire line of text before it actually shows up on the screen if you're quick enough). Clunky but most interesting: thanks for uploading! 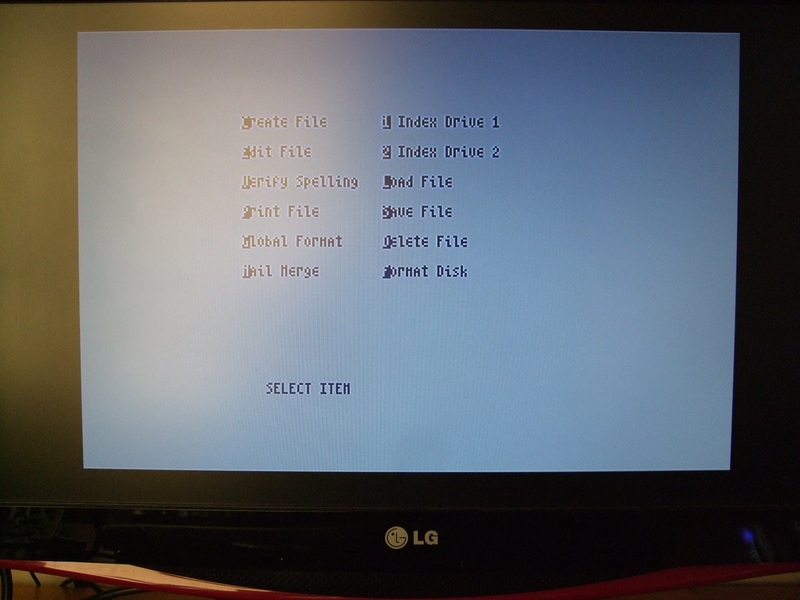 My initial tests, using my 1200XL described below, with Omniview 80 OS selected from my 32-in-1, I turn on the computer with the Atariwriter 80 Ominiview ATR mounted to disk one of A.P.E, it loads for a few seconds with the usual beebs, then starts the gurgling sound like when it can't find a disk drive, then prints "Read D1:DUP.SYS to the screen, more gurgling, then "ERR 138" then prints D1:DUP.SYS to the screen again under that, and everything stops, frozen there. That's my issue, I forgot from earlier in this thread that it depends on Antic banking that I don't have. So I am of no help here. I wasn't able to launch the ATR via the loader since the OmniView OS unfortunately lacks a PBI device handler, so I booted it via RespeQt. The U1MB's 576K CompyShop RAM model was used in order to provide ANTIC RAM access. Editing is pretty much as responsive as I remember it being in AtariWriter Plus, although the UI occasionally glitches (one may end up back in the editing screen with the main menu still in place over the top of it), and the lazy screen updates are sufficiently aggressive that scrolling becomes a bit disconcerting (auto-repeat scrolling causes only the top two lines of the display to be updated until the cursor key is released, at which point the whole thing repaints, so I don't think the author had the luxury of display list-assisted scrolling here). 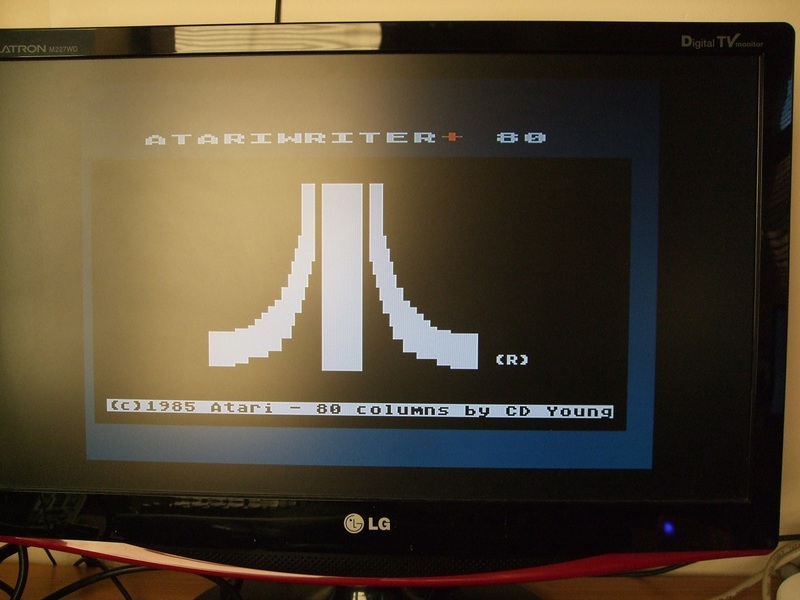 Quite an achievement and quite an undertaking, although I think it might have been easier to write an 80 column word processor from scratch than to hack AtariWriter Plus into compliance. Edited by flashjazzcat, Sun May 27, 2018 1:10 PM. Thank you for testing it out! This is so darn cool, we're all so lucky this was preserved. Thanks everybody. My primary machine from BITD had a switchable Omniview OS, but the 320K upgrade most likely broke ANTIC switching so will be an incentive to swap the OS in a stock XE. it's cool seeing a program with Antic bank switching put into practice. Edited by Nezgar, Sun May 27, 2018 4:17 PM. I was using a 130XE with the 320 upgrade and it was giving me problems also. It was unstable and did different unusual things on different boots. I removed the upgrade and using the stock 130XE and a switchable OS I have not been able to get the ATR file to boot. Are you using omniview XE or XL? I recall different versions of the OS, but not what the differences were. Thought crossed my mind this could be a factor. Also omniview disables basic by default, if you are holding option, that enables basic. May conflict. There are lot's of different OmniView versions around, both official and modified versions. Runs good on my 600XL with Antonia board and RespeQT. Only issue so far is that when I try to index a drive, nothing shows up, even after saving a file? Edited by JR>, Sun May 27, 2018 6:04 PM.